Business reviews and ratings are the new internet buzz in marketing. 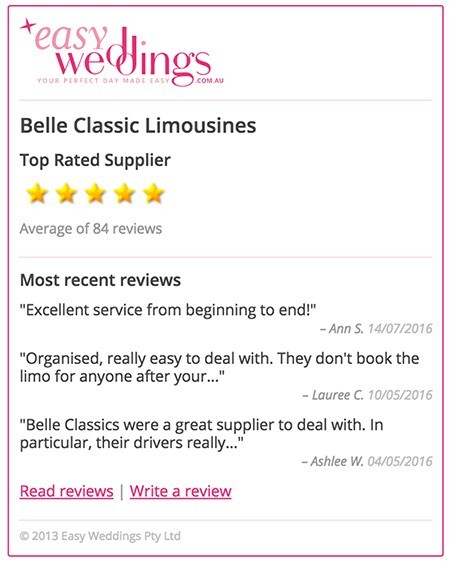 Belle Classic Limousines is proud to have received a five star rating by EasyWeddings.com.au for 2013, 2014 and 2015 from reviews posted by our brides. 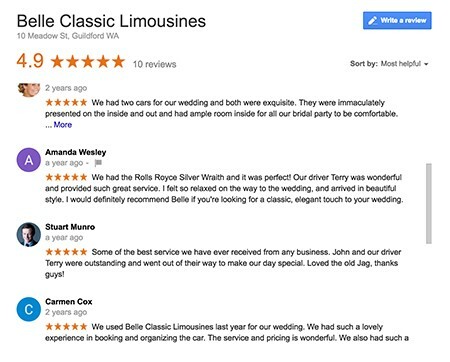 With over eighty reviews from past brides you can get a fair cross section of the consistently great service we provide and compared to the number of reviews received by other businesses our superior experience in the Perth wedding car and limousine industry. You can find more client feedback and reviews on our testimonials page, our Facebook page, Google+ and Yelp. Generally people have become aware that using review sites tends to give a cross section of feedback from some of the best and possibly the worst customer experiences related to the business. In many cases the business has no way to put its side of the story… so here is our view on reviews. Following the popularity of rating websites such as Trip Advisor and Urban Spoon many existing businesses like Facebook, Google and Yellow Pages added rating and review features and new directories like Yelp have emerged which add a new twist to the review market and thus grow their revenue base. The bottom line is hosting a review site makes a lot of advertising revenue. Many review sites give more favourable coverage to businesses who pay for premium advertising and listings. Easy Weddings is Australia’s leading wedding directory. Reviews on the site are from brides (I don’t think many guys would be strong users of the site) who have registered an account while planning their wedding and have returned after the event to review the businesses they dealt with (that advertise on Easy Weddings). Easy Weddings have also offered a service to contact brides on behalf of businesses to obtain reviews. 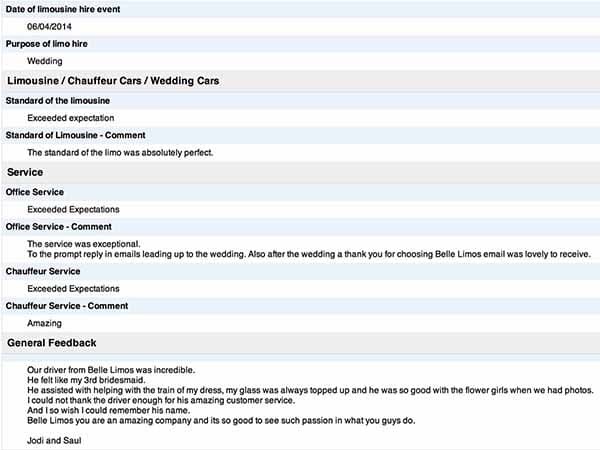 Our experience is pretty positive with Easy Wedding reviews. They do have a filtering system that allows not genuine or inaccurate reviews to be removed and businesses to remove some contentious reviews, so most businesses have a positive profile. The best gauge of a business on Easy Weddings is the number of reviews and to sense the common experience reported by brides. Yelp chooses to display a few of what it considers the most relevant reviews of a business, mainly by qualified yelpers. Other reviews are in the background if you look closely near the end of the displayed reviews section. The bottom line is Yelp reviews cannot be fiddled with by the business. Yelp also vets and categorises there users so they can quickly weed out false or fake reviewers. Consider Yelp reviews to be genuine and a valid reflection of a business (as long as multiple reviews give you a good cross-section of the business’ activity). You can see in the screen shot below that Yelp displays a small number of reviews – 3 noted for us although several client reviews that we are aware of are in the background. Facebook reviews are by qualifies Facebook users. Facebook is the most frequently used review platform in Perth and especially attracts people who have a negative experience to report it through a Facebook review or post. Once the review has been posted only the person who posts it can delete it, so it sticks a reflection of the poor or average service. You can tell when a business has a bad Facebook review reputation to hide because they have switched off their Facebook review panel (which is the only way to prevent the truth from being displayed publicly). BE VERY CAUTIOUS about trusting businesses that have their Facebook reviews deactivated, they are hiding what should be a valuable form of marketing and information that you can use to judge their performance. There is no way of knowing whether ‘fake account’ users are also providing reviews on Facebook, however, in the small business community of Perth it is wisest to work with the reviews supplied by your friends and known local users. We get many offers from Indian sources to buy Facebook friends and social media marketing which we reject. A large number of Facebook followers is not necessarily a sign of a popular business. Our number of Facebook followers may seem moderate compared to others, but they are genuine. See one of our Facebook experiences noted in ‘the ugly’ below. Google has made several adjustments to their business offerings and the latest change is to merge Google+, Google Maps, and Google reviews into a new format which offers ‘Google My Business’ as the business listing and ‘Google Local Guides’ as a qualified review platform. No doubt Google has the position to win the review war, but most importantly for a small business like ours – Google will trust the views of their qualified Local Guides and use that information to verify and promote businesses in their search algorithm. Google+ reviews are extremely important for marketing a small business. Whilst currently small in number only people with a Google business or Gmail account can review so Google reviews are made by genuine people. The success of the leading review sites has also spawned a range of competing internet listing services that generate large numbers of fake reviews on prominent review sites, and others that provide a business with 1000’s of false Facebook ‘friends’ for a small exchange of dollars – we do not participate in this type of marketing. 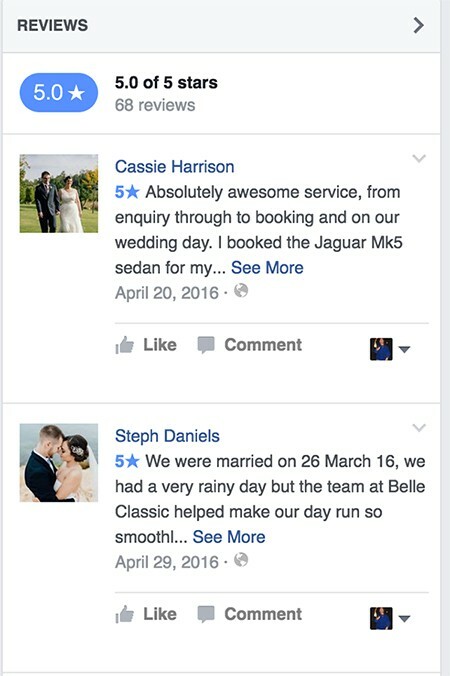 The follow-on for a small business like ours is that the number and quality of ‘reviews’ and the number of ‘likes’ can set a perceived standard for the business in the mind of the person searching for a limousine service or to hire wedding cars. To appear competitive (or possibly to be seen among the ever increasing review jungle) it has become necessary to join the review chase. With this in mind we remain optimistic that our clients receive outstanding service and we have left our Facebook page open for your comments and input. You must really wonder why some businesses have closed down their Facebook reviews from displaying. Occasionally this leads to exploitation from a misguided Facebook devotee, spam contributions or even a competitor looking for an advantage, but we believe our clients can see through any sham reviews. Please feel free to follow us on Facebook and Google+ and add your reviews after using our service. Check out the Facebook page of any business you are considering. If it is closed to customer comments and reviews be curious about why they don’t want client reviews made public. Good reviews sites will have a simple rating system from registered users of the review service. Easy Weddings, Google+, Yelp and Facebook as noted above provide an appropriate medium for the wedding industry. Facebook users are more inclined to post on their own page than review a business page. Google+ is probably the most important review medium for businesses but seems to be unfashionable with the huge number of Google users (very few reviews get posted there). Easy Weddings is the most reliable wedding review site in Australia with the businesses having no input into the reviews but a channel to dispute malicious reviews. Yelp is huge in the USA and has gained a loyal group of users in Australia. The positive thing about Yelp is that it qualifies its users over time and has a good system for selecting and presenting legitimate reviews. ABIA (Australian Bridal Industry Academy) is a private review business that markets itself in a way that it appears it sets the standards for the wedding industry. We have avoided paying hundreds of dollars each year just to put a coloured star on our business and ‘compete’ in an unreal environment for recognition. Up until this year it has rewarded businesses that advertise with it by issuing bronze, silver and gold stars to businesses who continue to pay for one, two or more years. Annual awards in each state have been decided from ratings given by couples chosen by the business after the wedding service. With only brides who seemingly had a fault free day being invited to review, it accounts for the high 95% – 100% industry standard that seems typical of the businesses represented. In 2014 they proposed to change their rating system to couples nominated by businesses on booking which should have given a more realistic set of ratings and make the results more meaningful. At this point there is no evidence to suggest that the change occurred. If we do choose to join ABIA it will be with a bronze star to start as that is their business model, advancing to a gold star depending upon the number of years we remain connected to the site. Only a few Perth businesses subscribe to ABIA and annual winners make a lot of show displaying their ‘best in Perth’ logo but it is from a very small number of entrants in most categories. New internet ventures are emerging that attempt to extract reviews from a business’ clients to post on review sites in exchange for the opportunity to win prizes. With directories like ABIA there is also a search preference to listed businesses that also pay for advertising on the site. This is the same for many ‘free to list’ business directories. From a buyers perspective I guess we need to be a little sceptical when using second tier search tools on the net. To its credit Google attempts to find relevant results, however, big marketing budgets will always bring businesses to the forefront of the paid ads as well as the organic search results whilst not guaranteeing the best business for you – look past the first page and be thorough with your validation of the business. Malicious reviews on many of the internet review sites usually stick regardless of their validity. Facebook, Google and Yelp are foreign owned with no simple way for small businesses to interact, remove or correct inappropriate or inaccurate content or reviews. 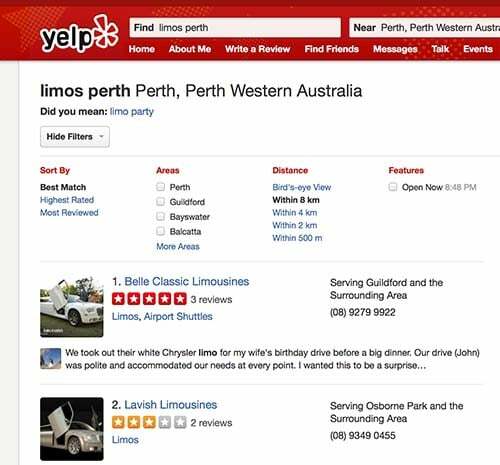 Typical of this is when the Belle Classic Limousines Facebook page received a scathing review intended for a less than perfect Las Vegas (USA) business (see the images below). Despite several attempts to interact with Facebook, the girl who wrote the review, and approaching Facebook through an Australian affiliate business the review has not and it appears cannot be removed. The latest update – 12 months after posting Shanna Lee’s comment was removed from our page by Facebook – I think. For a technology company it is not surprising the focus is on profits and not a lot is invested on user satisfaction when things go wrong. Obviously others feel the same about this business. We still believe the best way to choose the company you will do business with is to make personal contact or listen closely to the referral of friends or other trusted businesses. Belle Classic is a preferred or recommended limousine supplier with over 20 of Perth’s leading wedding venues including Acqua Viva, Assured Ascot Quays Hotel, Ambrose Estate, Bathers Beach House Fremantle, Belvoir Homestead Reception Centre, Brookleigh Estate, Brookside Winery, Burswood on Swan, Carilley Estate Winery, Caversham House, Core Cider House, Darlington Estate Winery, Joondalup Resort, Mandoon Estate Winery, Millbrook Winery, Mosoman Park Golf Club, Mosmans Restaurant, Mulberry-on-Swan, Novotel Langley Hotel, Pagoda Resort & Spa, Parmelia Hilton Hotel, Riverbank Winery, Rose & Crown Hotel, Sandalford Winery, Sittella Winery. These referrals are not given lightly by venues who value their reputation (as we do ours). Belle is also a recommended wedding car and limousine provider by many of Perth’s leading wedding photographers. They are most complimentary of the friendliness and cooperative nature of our chauffeur staff. Check our reputation with any of the following photographers A to Z when you are inquiring about your wedding photography: Absolute and Alive Photography; A&C Photography; A Woman’s Touch; Compose Photography; Deray and Simcoe; Erica Serena; Fotografia Coppola; James Burton Photography; Jason Soon Photography; Jason Tey Photography; Jemma Keech Photography; Kate Smeda Photography; Katie Grant; Kevin McGinn Photography; Lumens Photography; Peter Edwards Photography, Pro Photo; Protography; Sandie Bertrand; Spoilt Weddings; Tonita Photography; Verge Studio; Warnock imagery; We are all Stardust; Ze Photography. Trust our experience and reputation on your wedding day. Contact Belle Classic Limousines via our on-line inquiry form or telephone the office on (08) 9279 9922 to see how our friendly staff can help arrange transport for your special occasion. Belle Classic is proactive at improving our business model by seeking feedback from clients after the event. The feedback is used to improve office procedures and inform staff of areas that may be improved. We look forward to receiving your feedback in future.